The programs we’ve looked at so far simply display messages, which doesn’t involve a lot of real computation. This chapter will show you how to read input from the keyboard, use that input to calculate a result, and then format that result for output. We have been using System.out.println for a while, but you might not have thought about what it means. System is a class that provides methods related to the “system” or environment where programs run. It also provides System.out, which is a special value that provides methods for displaying output, including println. This output indicates that System.out is a PrintStream, which is defined in a package called java.io. A package is a collection of related classes; java.io contains classes for “I/O” which stands for input and output. The numbers and letters after the @ sign are the address of System.out, represented as a hexadecimal (base 16) number. The address of a value is its location in the computer’s memory, which might be different on different computers. In this example the address is 685d72cd, but if you run the same code you might get something different. 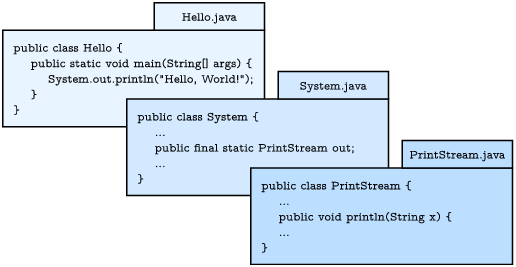 As shown in Figure 3.1, System is defined in a file called System.java, and PrintStream is defined in PrintStream.java. These files are part of the Java library, which is an extensive collection of classes you can use in your programs. Figure 3.1: System.out.println refers to the out variable of the System class, which is a PrintStream that provides a method called println. The System class also provides the special value System.in, which is an InputStream that provides methods for reading input from the keyboard. These methods are not easy to use; fortunately, Java provides other classes that make it easier to handle common input tasks. This import statement tells the compiler that when you say Scanner, you mean the one defined in java.util. It’s necessary because there might be another class named Scanner in another package. Using an import statement makes your code unambiguous. Import statements can’t be inside a class definition. By convention, they are usually at the beginning of the file. This line declares a Scanner variable named in and creates a new Scanner that takes input from System.in. If you omit the import statement and later refer to Scanner, you will get a compiler error like “cannot find symbol”. That means the compiler doesn’t know what you mean by Scanner. You might wonder why we can use the System class without importing it. System belongs to the java.lang package, which is imported automatically. According to the documentation, java.lang “provides classes that are fundamental to the design of the Java programming language.” The String class is also part of the java.lang package. At this point, we have seen all of the elements that make up Java programs. Figure 3.2 shows these organizational units. Figure 3.2: Elements of the Java language, from largest to smallest. 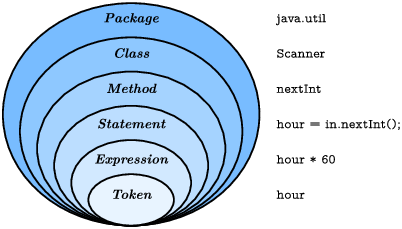 To review, a package is a collection of classes, which define methods. Methods contain statements, some of which contain expressions. Expressions are made up of tokens, which are the basic elements of a program, including numbers, variable names, operators, keywords, and punctuation like parentheses, braces and semicolons. The standard edition of Java comes with several thousand classes you can import, which can be both exciting and intimidating. You can browse this library at http://docs.oracle.com/javase/8/docs/api/. Most of the Java library itself is written in Java. Note there is a major difference between the Java language, which defines the syntax and meaning of the elements in Figure 3.2, and the Java library, which provides the built-in classes. Now let’s see an example that’s a little more useful. Although most of the world has adopted the metric system for weights and measures, some countries are stuck with English units. For example, when talking with friends in Europe about the weather, people in the United States might have to convert from Celsius to Fahrenheit and back. Or they might want to convert height in inches to centimeters. This code works correctly, but it has a minor problem. If another programmer reads this code, they might wonder where 2.54 comes from. For the benefit of others (and yourself in the future), it would be better to assign this value to a variable with a meaningful name. We’ll demonstrate in the next section. A value that appears in a program, like 2.54 (or " in ="), is called a literal. In general, there’s nothing wrong with literals. But when numbers like 2.54 appear in an expression with no explanation, they make code hard to read. And if the same value appears many times, and might have to change in the future, it makes code hard to maintain. This version is easier to read and less error-prone, but it still has a problem. Variables can vary, but the number of centimeters in an inch does not. Once we assign a value to cmPerInch, it should never change. Java provides a language feature that enforces that rule, the keyword final. Declaring that a variable is final means that it cannot be reassigned once it has been initialized. If you try, the compiler reports an error. Variables declared as final are called constants. By convention, names for constants are all uppercase, with the underscore character (_) between words. Like print, printf does not append a newline. So format strings often end with a newline character. The format specifier \%d displays integer values (“d” stands for “decimal”). The values are matched up with the format specifiers in order, so inch is displayed using \%d, and cm is displayed using \%f. Learning about format strings is like learning a sub-language within Java. There are many options, and the details can be overwhelming. Table 3.1 lists a few common uses, to give you an idea of how things work. For more details, refer to the documentation of java.util.Formatter. The easiest way to find documentation for Java classes is to do a web search for “Java” and the name of the class. But the result is an error – you get something like, “Bad types in assignment: from double to int.” The problem is that the value on the right is floating-point, and the variable on the left is an integer. The simplest way to convert a floating-point value to an integer is to use a type cast, so called because it molds or “casts” a value from one type to another. The syntax for type casting is to put the name of the type in parentheses and use it as an operator. The (int) operator has the effect of converting what follows into an integer. In this example, x gets the value 3. Like integer division, converting to an integer always rounds toward zero, even if the fraction part is 0.999999 (or -0.999999). In other words, it simply throws away the fractional part. Type casting takes precedence over arithmetic operations. In this example, the value of pi gets converted to an integer before the multiplication. So the result is 60.0, not 62.0. The parentheses after the cast operator require the division to happen before the type cast. And the result is rounded toward zero; we will see in the next chapter how to round floating-point numbers to the closest integer. Let’s take the example one step further: suppose you have a measurement in inches and you want to convert to feet and inches. The goal is divide by 12 (the number of inches in a foot) and keep the remainder. We have already seen the division operator (/), which computes the quotient of two numbers. If the numbers are integers, it performs integer division. Java also provides the modulus operator (\%), which divides two numbers and computes the remainder. The first line yields 6. The second line, which is pronounced “76 mod 12”, yields 4. So 76 inches is 6 feet, 4 inches. The modulus operator looks like a percent sign, but you might find it helpful to think of it as a division sign (÷) rotated to the left. The modulus operator turns out to be surprisingly useful. For example, you can check whether one number is divisible by another: if x \% y is zero, then x is divisible by y. You can use modulus to “extract” digits from a number: x \% 10 yields the rightmost digit of x, and x \% 100 yields the last two digits. Also, many encryption algorithms use the modulus operator extensively. Although not required, all variables and constants are declared at the top of main. This practice makes it easier to find their types later on, and it helps the reader know what data is involved in the algorithm. For readability, each major step of the algorithm is separated by a blank line and begins with a comment. It also includes a documentation comment (/**), which we’ll learn more about in the next chapter. Many algorithms, including the Convert program, perform division and modulus together. In both steps, you divide by the same number (IN_PER_FOOT). When statements get long (generally wider than 80 characters), a common style convention is to break them across multiple lines. The reader should never have to scroll horizontally. When you read a String followed by an int, everything works just fine. But when you read an int followed by a String, something strange happens. To understand what is happening, you have to understand that the Scanner doesn’t see input as multiple lines, like we do. Instead, it gets a “stream of characters” as shown in Figure 3.3. Figure 3.3: A stream of characters as seen by a Scanner. The arrow indicates the next character to be read by Scanner. When you call nextInt, it reads characters until it gets to a non-digit. Figure 3.4 shows the state of the stream after nextInt is invoked. Figure 3.4: A stream of characters after nextInt is invoked. At this point, nextInt returns 45. The program then displays the prompt "What is your name? " and calls nextLine, which reads characters until it gets to a newline. But since the next character is already a newline, nextLine returns the empty string "". To solve this problem, you need an extra nextLine after nextInt. This technique is common when reading int or double values that appear on their own line. First you read the number, and then you read the rest of the line, which is just a newline character. A group of classes that are related to each other. The location of a value in computer memory, often represented as a hexadecimal integer. A collection of packages and classes that are available for use in other programs. A statement that allows programs to use classes defined in other packages. A basic element of a program, such as a word, space, symbol, or number. A value that appears in source code. For example, "Hello" is a string literal and 74 is an integer literal. A number that appears without explanation as part of an expression. It should generally be replaced with a constant. A variable, declared final, whose value cannot be changed. A string passed to printf to specify the format of the output. A special code that begins with a percent sign and specifies the data type and format of the corresponding value. An operation that explicitly converts one data type into another. In Java it appears as a type name in parentheses, like (int). An operator that yields the remainder when one integer is divided by another. In Java, it is denoted with a percent sign; for example, 5 \% 2 is 1. The code for this chapter is in the ch03 directory of ThinkJavaCode. See page ?? for instructions on how to download the repository. Before you start the exercises, we recommend that you compile and run the examples. If you have not already read Appendix A.3, now might be a good time. It describes the command-line interface, which is a powerful and efficient way to interact with your computer. Exercise 1 When you use printf, the Java compiler does not check your format string. See what happens if you try to display a value with type int using \%f. And what happens if you display a double using \%d? What if you use two format specifiers, but then only provide one value? Exercise 2 Write a program that converts a temperature from Celsius to Fahrenheit. It should (1) prompt the user for input, (2) read a double value from the keyboard, (3) calculate the result, and (4) format the output to one decimal place. For example, it should display "24.0 C = 75.2 F". Here is the formula. Be careful not to use integer division! Exercise 3 Write a program that converts a total number of seconds to hours, minutes, and seconds. It should (1) prompt the user for input, (2) read an integer from the keyboard, (3) calculate the result, and (4) use printf to display the output. For example, "5000 seconds = 1 hours, 23 minutes, and 20 seconds". Hint: Use the modulus operator. Like the Scanner class we saw in this chapter, Random has to be imported before we can use it. And as we saw with Scanner, we have to use the new operator to create a Random (number generator). Then we can use the method nextInt to generate a random number. In this example, the result of nextInt(100) will be between 0 and 99, including both. Adding 1 yields a number between 1 and 100, including both. The definition of GuessStarter is in a file called GuessStarter.java, in the directory called ch03, in the repository for this book. Compile and run this program. Modify the program to prompt the user, then use a Scanner to read a line of user input. Compile and test the program. Read the user input as an integer and display the result. Again, compile and test. Compute and display the difference between the user’s guess and the number that was generated.